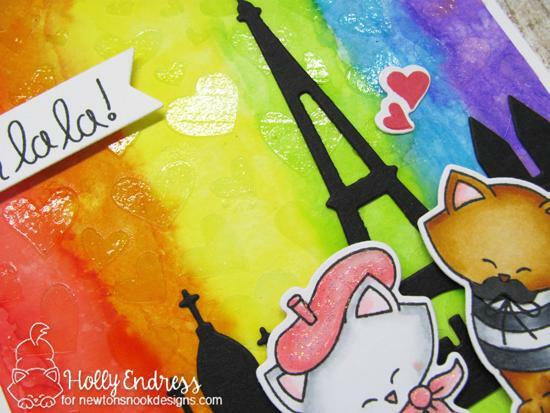 Today we are sharing this gorgeous rainbow oh la la card by Holly! 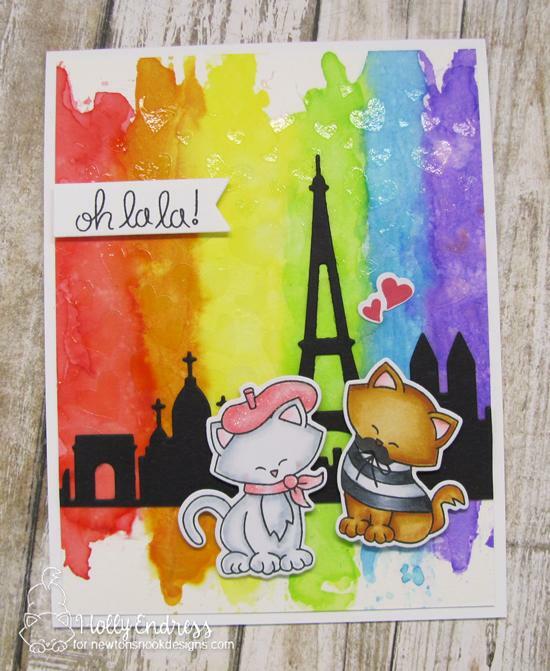 Her card features two of our cute kitties from our Newton Dreams of Paris Stamp Set. She colored the kitties with copic markers and trimmed them out with the coordinating Newton Dreams of Paris Die Set. She also added a bit of sparkle on the pink beret and a mustache on the boy kitty! So adorable! For her card, she created an amazing rainbow background using distress inks. Then she used our Tumbling Hearts Stencil with some Transparent embossing paste to create a subtle heart texture over the top! Here's a close-up so you can see how pretty it is! She also added a little silhouetted scene of Paris (using a die from another company) and finished off the card with the "oh la la" sentiment from the Newton Dreams of Paris Stamp Set. This adorable card would make a lovely Valentine but could really be sent to a friend any time of year! Oh pretty, I love the background Holly, really makes the images pop! Voilà une belle et adorable carte ! Loooove those bright and bold colors on the background place in the rainbow order!! !